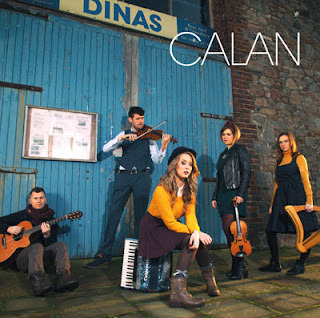 The name of the Welsh band Calan translates as new year or beginning—think of the root of the word calendar. True to their name, this promising young quintet is a fresh collection of energy, innovation, and a little bit of cheek. Like most young bands, it's a work in progress, but if Dinas ("city") is any indication, we can look forward to flipping to the next page when the time comes. Most of the material is traditional, but there isn't any mold on it. Instead, Calan incorporates outside influences. "Tale of Two Dragons" sets the table as both the CD's opening and concluding track, first in English, then in Welsh as "Chwedyl Ddwy Ddraig." But before you get caught up in cheap psychoanalysis of the split Welsh identity, give a good listen. Its heart racing pace, full instrumentation, and overall wildness are more Scandinavian in nature and reminiscent of the Swedish folk/industrial rock band Garmarna. But the band they most remind me of at this stage of their development is Scotland's Capercaillie. If you happen to own a copy of Capercaillie's 1984 debut Cascade, give it a listen and then dip into Calan sets such as "Fflopsi Mopsi," "Set Stephen," and "Jig-Sô" and you'll hear similar patterns of instruments chasing each other in circles until they produce a musical swell. It is, of course, unfair to expect Calan's lead vocalist Belthan Rhiannon Williams-Jones to sound like Karen Matheson–a voice that appears once in a generation. Williams-Jones has a much lighter tone and her youth is heard on slower songs, but she can do a few things Ms. Matheson does not: play a mean accordion, or put it down and step dance. Calan's unique aspect is that it supplements strong playing with stunning stage effects. Give a good listen to the percussion on this album. Some of it is guitarist Sam Humphreys thumping a kick drum, but most of it is the sound of feet–lots of them. Williams-Jones usually dances in tandem with fiddler Angharad Siân Jenkins, but even harper Llinos Eleri Jones straps her instrument over her shoulder so she can tap and move to the pulsing beats. (You can hear Jones' harping in a a more tranquil setting on "Y Clychau," as well as some spirited fiddling and even a touch of piping.) To get a sense of how much heat the feet can generate, listen to "Gwdihŵ Shoes" whose effect is that of woodpeckers on a runaway steam train. (It sounds even better live and the dancing is visually spectacular.) The album Dinas also shows there's room for growth, especially in Calan's slower material. I'm not a fan of the more contemporary songs, but that's a personal preference and I'd rather we celebrate the beginning of a superb lineup of young musicians. I'd also like to give a special shout-out to Calan's resident master-of-just-about-everything: Patrick Rimes. All he does on Dinas is play the fiddle, bagpipes, the Welsh pigborn, whistles, accordion, and piano.